Madoff's lack of ethics may apply to his views on marriage as well as money. 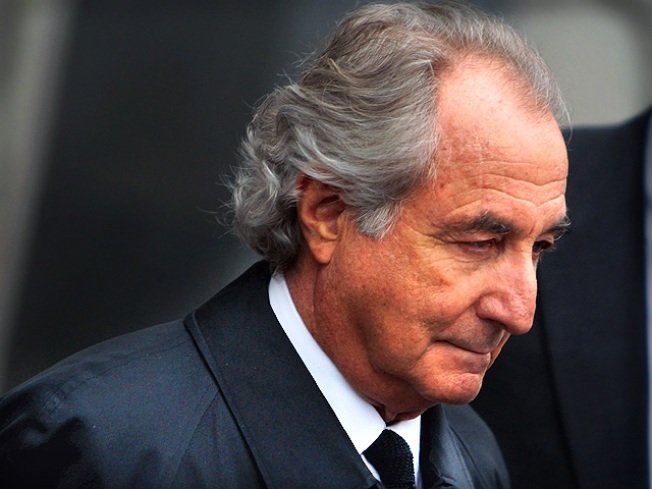 One of the recession’s most hated characters, Bernie Madoff, is showing no remorse in federal prison for defrauding thousands of investors of billions of dollars with his wealth management business turned ponzi scheme. According to fellow inmate K.C. White, a bank robber and prison artist, Madoff got angry one evening and blurted, “F--- my victims. I carried them for 20 years, and now I’m doing 150," New York magazine reports. Writer Steve Fishman of New York magazine contacted inmates in the Butner, N.C., correctional facility, where the 71-year-old is serving, and the magazine published the insider report yesterday. Madoff hangs out with the likes of former mob boss Carmine Persico and Israeli spy Jonathan Pollard, according to the mag. Fishman goes on to unveil that Madoff is relishing a rock-star status behind bars. Inmates clamor for autographs and ask for financial advice, and groupies follow him as he exercises on the gravel track. Robert Rosso, another lifer, called him a “hero” and said, “he’s arguably the greatest con of all time,” on the Web site ConvictINC.com. Nancy Fineman, an attorney who interviewed Madoff after he arrived at Butner, said he enjoyed being a celebrity, but he refused to sign anything because he was sure they’d sell it online. "He still did have a big ego,” Fineman told New York magazine. When he first arrived, he confidently walked around the prison, despite that he didn’t know how to take a shower, according to his former cell mate John Bowler. Although he’s past the age for manual labor, Madoff eagerly applied for jobs at the prison. The former chairman of NASDAQ had hoped for a job on the landscaping crew, but was assigned sweeping the cafeteria floor for 14 cents an hour. He suggested working as a budget clerk but was denied. "Hell, no," said Shawn Evans, who spent 28 months at Butner and was the budget supervisor. Madoff’s stresses seem to have chipped away in prison as he told investigators that it was a “nightmare” living with the nagging feeling that he’d be uncovered at any moment. “I wish they caught me six years ago, eight years ago,” he said. The man who used to own a collection of more than 40 watches, including Rolexes to a Piaget, is “stingy” in prison and now only has a Timex Ironman he bought for $41.65 at the commissary. Shannon Hay, a former drug dealer who was released in December, lived in Madoff’s unit at Butner and said he painted a Robin Hood picture when telling his story in prison.